Good manufacturing processes are essential to the production of good food. All employees, whatever their job role must understand why they are being asked to achieve certain standards and perform to a high level. Without understanding, no one will perform consistently to the high standards required. In today’s food manufacturing environment, even a small chance of failure is too high. 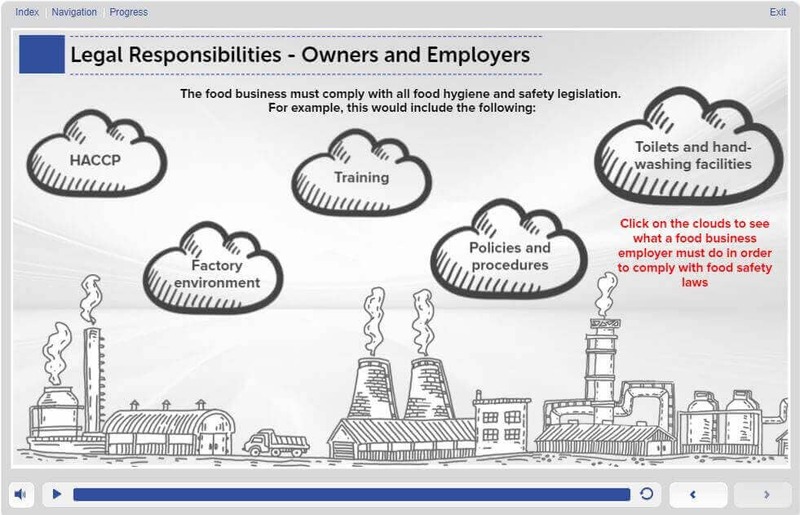 Food hygiene training is compulsory for all who work in food, but this e-learning course will make it easy and enjoyable whilst benefitting from the financial savings brought by on-line learning. Training Accredited by City & Guilds, be assured that the courses you purchase for yourself or staff will be recognised by all auditing authorities. Who should take this level 2 food course for manufacturing? Users of the Level 2 Food Safety in Manufacturing course will be allowed to spend as much time as they require studying the course. There is no need to rush. As an indicator only, if the user ran straight through the course without stopping or repeating pages, it would take about 2 – 3 hours. 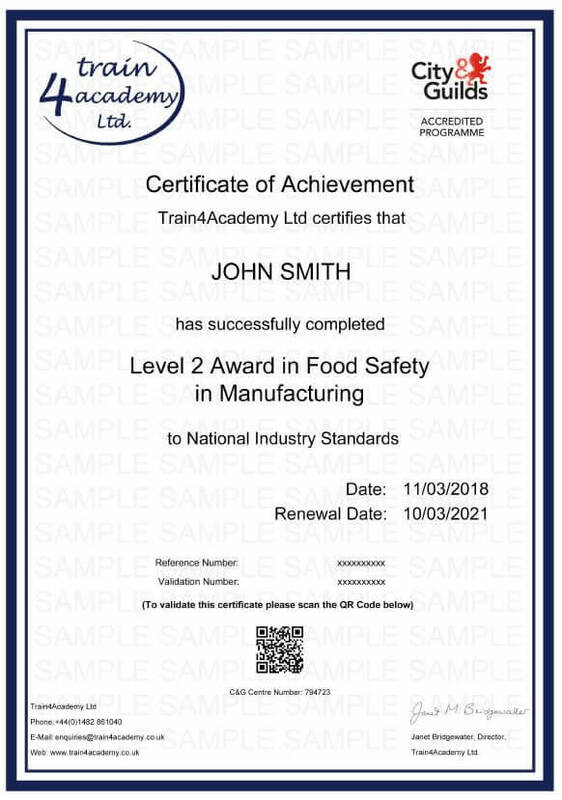 Our Level 2 Food Safety & Hygiene in Manufacturing is Accredited by City & Guilds, allowing us to provide the most up to date and industry recognised course. On successful completion of the course assessment, the candidate will be able to print/save their certificate. In addition to this, an email is sent to the candidate containing a link to the certificate. How long does a Level 2 Food Hygiene certificate last? A Food Hygiene Certificate does not have an expiry date, however we advise you to refresh your knowledge every 3 years. This ensures you keep up to date with the latest food safety and hygiene legislation. Our Food Safety and Hygiene Level 2 for Catering course has been approved by Environmental Health Officers with its content developed in accordance to their guidelines, which means you can be sure you’re receiving the right training for your role. All of Train4Food courses are certified by the CPD Certification Service as conforming to universally accepted CPD guidelines . This level 2 food hyiene and safety for manufacture course provides 2 - 3 points towards your Continuing Professional Development (CPD). Click on screenshots for a larger image for course. The online assessment for the course consists of 30 multiple choice questions. In order to be successful, candidates must achieve a 75% pass mark to obtain the certificate. The assessment is timed and candidates are given 45 minutes to complete the assessment. The average time required to complete the learning is approximately 2 - 3 hours. However the course is designed to go at the pace of the learner and can be completed in more time if needed. If you don’t pass the assessment first time there is no need to worry. We offer you unlimited FREE resists to make sure that you pass and get your certificate in food safety & hygiene level 2 for manufacturing, stress free. The Importance of Food Safety This module covers the importance of maintaining a high standard of food safety management and the consequences if this is not upheld. 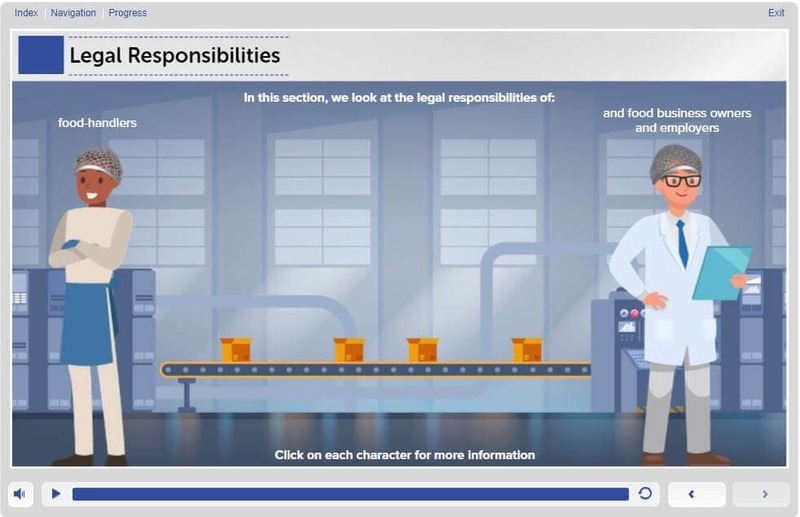 It looks at the legal responsibilities of a food worker and why it is imperative that food remains safe for the consumer. The Importance of Personal Hygiene This module concentrates on the importance of maintaining high standards of personal hygiene, in-order to work safely when handling and storing food in the workplace. It looks at how personal hygiene can result in the contamination and cross-contamination of foods. 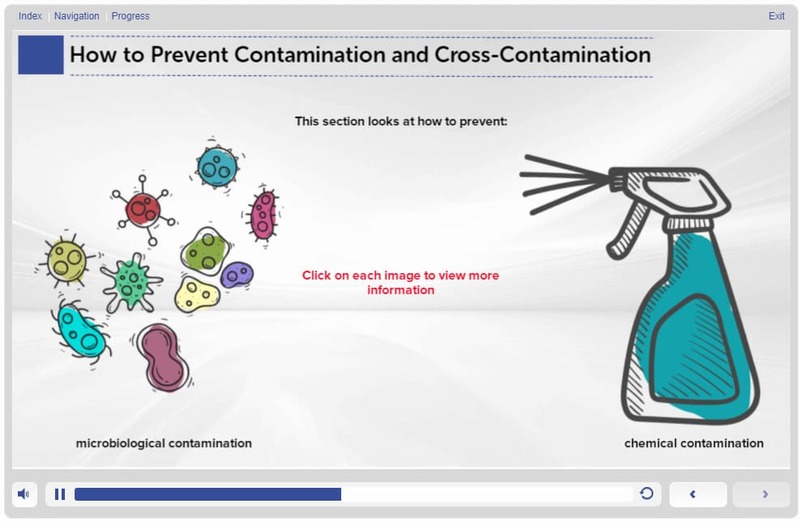 Safe Cleaning and Use of Chemicals This module looks at how to achieve the highest cleaning standards at all times with the use of cleaning chemicals, disinfectants and effective cleaning methods, while maintaining your safety and the health of the consumer. 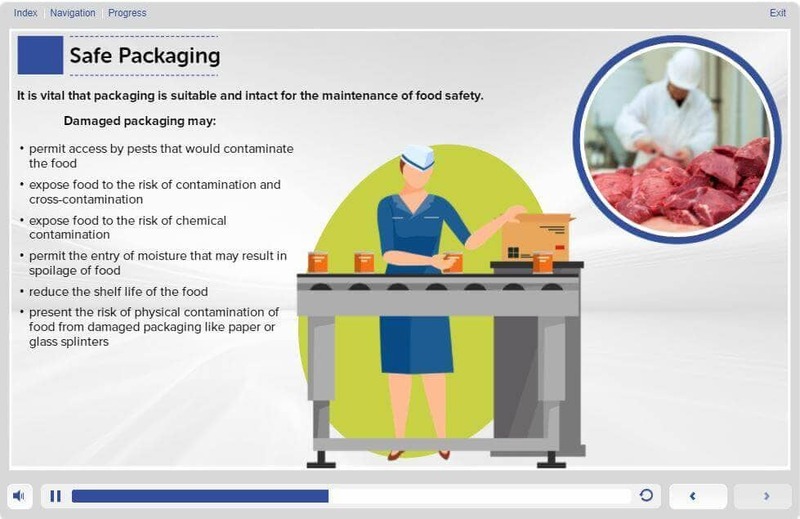 Food Safety Hazards This module looks at the knowledge you will need to work safely with all foods, raw and cooked, at every stage of the food preparation process. Temperature and Storage Control This module covers the importance of working with food safely in the preparation, cooking and holding of food safely during manufacturing processes. This food hygiene course is suitable for all that are working with foods both raw and ready to eat.